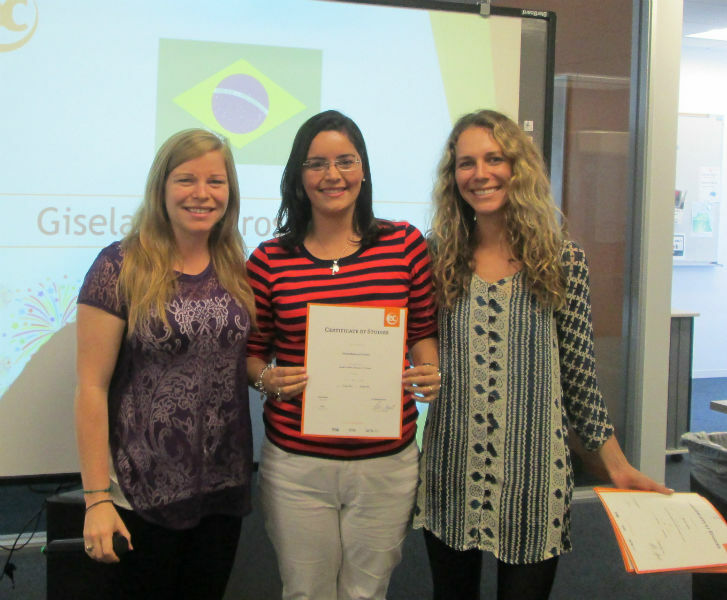 Gisela's Testimonial: "It was an amazing exchange of culture"
Gisela with EC San Francisco teachers Heather and Vera. Gisela is a Brazilian student who studied at EC San Francisco for six weeks this summer in the English for Work program. As an accountant in Rio de Janeiro she was looking for English courses that would target her specific needs of learning to use English within a business context. Everybody here at EC San Francisco and at the student residence is going to miss Gisela’s friendliness, her eagerness to always practice her English (both inside the classroom and out), and how fun she is to be around. What was your favorite thing about EC San Francisco? People who work here. All of them are very kind… I loved my experience with my classmates too. It was an amazing exchange of culture. What is your favorite memory of San Francisco? The people who live here… I’ll remember all of them for the rest of my life. Enjoy your life here with maximum open mind and allow all things that are good for you to learn English. Make friends for the rest of your life! We are so glad that you enjoyed your time here at EC San Francisco, Gisela! Best of luck in all your future endeavors!